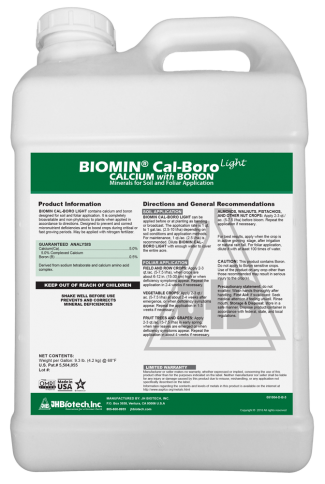 Biomin Cal-Boro Light is indicated when Calcium and Boron levels in the plant are below desired levels and need to be quickly restored to optimum. Calcium and/or Boron deficiency in plant determined by test, observation, or known nutritional needs of certain plants and/or systems. Biomin amino acid chelated Cal-Boro Light (5% Ca, 0.5% B), provides easily absorbable and “plant friendly” Calcium and Boron for immediate use by the plant. Another Biomin product, Cal-Boro (5% Ca, 1.0% B), is recommended in certain situations where additional Boron is needed. These are critically important nutrients for pollination, leaf growth, fruit formation, disease resistance and shelf life. Liquid formulation, chelated with amino acids, readily absorbed and utilized in the plant.